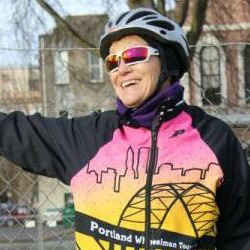 This ride starts at the Clark College parking lot off of Fort Vancouver Way in Vancouver. Learn about group cycling and explore by bike. Build your skills and test your mettle. Mostly flat (a couple of slight hills) and easy. Find out why bicycling is such a popular sport - You can do it! We will head east and socialize at Angel’s Donuts and Ice Cream. This ride caters to novice/slower riders. Pace will be 12 - 15 mph with modifications for specific group.